Nelson-Field tells AdNews both active and passive play a role, but active is about twice as valuable as passive. This doesn’t diminish the value of passive attention. Nelson-Field tells AdNews she believes passive viewing has a large role to play and likens this to peripheral vision. “It's not as large as active attention, but it goes a way to helping you recognise the brand,” she adds. “If you have someone near you in your peripheral vision, you don’t have to be looking at them to know they are there. 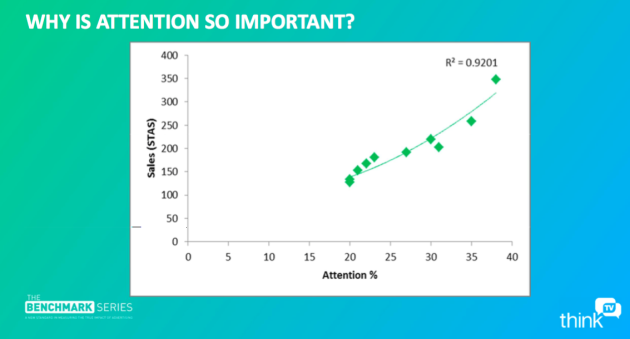 Attention is important because it’s a measure of impact and directly correlates with short-term sales. The chart below illustrates that the more attention there is, the greater the sales impact. Screen coverage is an artefact of clutter. Previously Nelson-Field has conducted a study that measured clutter by how the frequency of ads impacted recall, see chart below. This study used a new method to measure the percentage of a screen different formats cover – a metric referred to as ‘screen coverage’. It found on average that TV had 100% screen coverage, compared to YouTube’s 30% and Facebook’s 10%. The analysis only measured YouTube and Facebook on desktop. On mobile, their screen coverage is likely to improve significantly, particularly for Facebook, which designs ads specifically for mobile. Good screen coverage was closely aligned to a platform's active. There was also a strong correlation between screen coverage and active watching as well as sales. 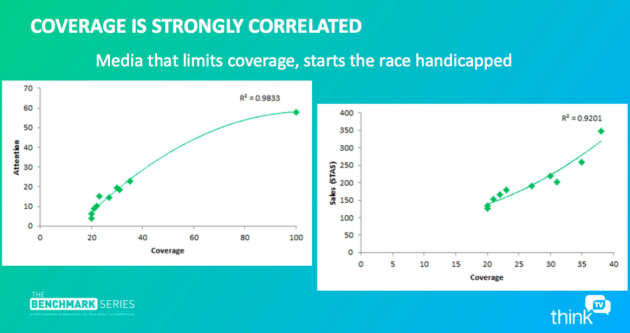 “We know that competition on the screen makes a difference to the ability to recall so we decided to use coverage as a universal measure to see whether we could see any differences in the scores,” Nelson-Field says. “Sure enough attention is highly related to coverage. The study also measured different brand characteristics between good ads, the ones that drive sales, and bad ads across all three platforms. It found that good ads showed the brand at twice the size of bad ads, twice as often and was 25% more likely to display branding within the first two seconds. "I think people underestimate the importance of being able to see a brand and how that helps. That's not a TV thing, it's across all platfroms," Nelson-Field adds. The study looked at the brand frequency within individual ads rather than how frequently an ad ran. Nelson-Field says relevance of ad placement is a far more effective driver of results than “hitting someone over the head with the same ad until they are persuaded to buy”. Further findings from the Benchmark Series, such as the drivers of brand growth, will be revealed at the ReThinkTV event on 14 September. Television advertising has a stronger impact on short-terms sales than Facebook and YouTube because it attracts more viewer attention and has better screen coverage, new research has found. 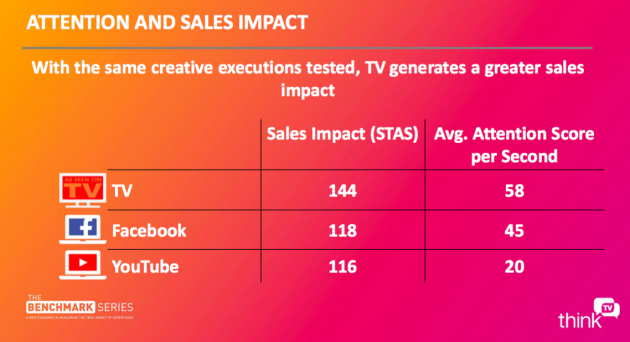 TV advertising's short-term sales impact score was 24.1% stronger than YouTube and 22% stronger than Facebook. The most important new finding is the role screen coverage plays on attention and sales. The study was commissioned by ThinkTV but carried out independently by Professor Karen Nelson-Field and is the first tranche of The Benchmark Series. It used AI machine learning and eye-tracking technology to passively monitor the movement of people's eyes when they used different platforms. 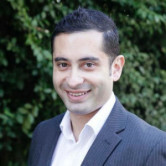 It measured the behaviour of 2,583 Australians and the presence of 18,219 ads in natural viewing conditions, such as at home. The behavioural data was then correlated with a discrete choice modelling study of 38,745 different brands to assess how advertising across the platforms correlates with consumers' choice of brand. It found a strong correlation between sales and three factors: viewer attention, screen coverage and brand quality. TV commanded nearly twice as much active watching of ads as YouTube and 14-times more than Facebook. Facebook was by far the best platform for passive watching (see graphic), which means that people may have their eyes on a screen where an ad is present but they are not focused on the content.